If there’s one element missing from many dining experiences it’s having some genuine fun and a little revitalizing enjoyment in a meal. Chin Chin, Melbourne’s latest cutting-edge dining inveiglement is pure energized fun from the moment you walk in the door and feel the wave of human vigour and pulsating ambience. It’s the sort of place that is instantly reassuring, that is you’re assuredly in the right place for a good time or at the minimum, part of all the beautiful people grooving along to the hum of this cosmopolitan gaggle. It’s the perfect place for a person like me, on the verge of a half century and careering towards a midlife crisis to feel vernal and yet equally at home with the retro music score engulfing the room; as Christine Amphlett of the Divinyls, chorus’s “Its fine line between pleasure and pain, you’ve done it once, you can do it again…”. Anyway, fifty is the new forty, right. It’s probably not the sort of place to bring your grandmother, but its ok for any age group really, long as you don’t have a hearing problem. Actually, looking around the room the demographic has nothing to do with age whatsoever, rather a full CT scan of an urban cities stomach and the cultural kaleidoscope and culinary epoch of Melbourne. Entrepreneur, proprietor and creator of Chin Chin, Chris Lucas, prophesizes “This is the future of Melbourne dining”, the emphasis being on casual and good-value but the requisite ‘theatre’ is essential, as in a full house audience. And there’s the axiom – theatre. In my formative years as sommelier my mentor, legendary chef and restaurateur Bruno Anderson, drilled me constantly, “Restaurants are all about theatre and as actors in leading roles, our personality and competence is crucial to every night’s performance”. He made us down a glass of snaps before service on Saturday nights for extra courage. Of course, theatre needs a stage and set, or in this case, decor and ambience; pivotally an engaging set that definitively broadcasts the script. 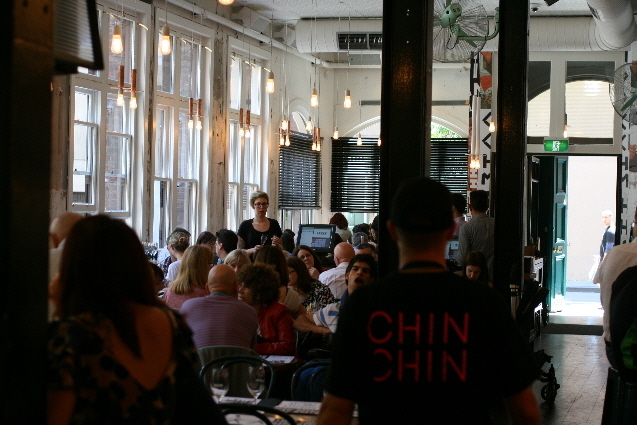 Chin Chin is a brilliant stage set; a cavernous space that exudes a warehouse-like liberal rawness with high exposed ceilings and the amplitude of splendid Victorian period architecture building in Flinders Lane, the industrial CBD of old Melbourne. Back lanes in cities are magnetic and invariably where all the best restaurants, bars and hangouts are hidden and Chin Chin lives up to the underground rule of minimal signage. Once you are inside though, it’s like another world with the natural light streaming in through capacious windows adding conduciveness to the all day dining concept. I should add we were there for Sunday lunch, so our impression was one of brightness and effervescence however, with the visibly designer lighting one senses the atmosphere would be appropriately evocative and moody at night. French bistro chairs are indicative of the relaxed tone here and predictably tables are close quarters with a few inches sufficiently demarcating your eating space at the same time encouraging communal socializing, all part of the mojo. All day dining (7 days 11am to late) and a no bookings policy underline the informality, a fast-growing trend in Melbourne that is creating some controversy. I would suggest the pampered Melbourne diners needs to adjust to some big city brutality; in New York a table reservation means nothing other than traffic control (very powerful Maitre ‘d or hostess) putting you in a holding pattern at the bar. I would however recommend you arrive just ahead of the conventional peak dining times, or be on your best behaviour (grovel) with the door hostess, as you jostle for a position at the bar. A good option if you are a pair, or solo, is eat at the open-plan kitchen bar with the added excitement of watching the chefs in action. There is also a downstairs bar, Bar Go-Go, opening in time for the horse racing carnival, which will I am sure will heave and be a great place for compotation and naughtiness. 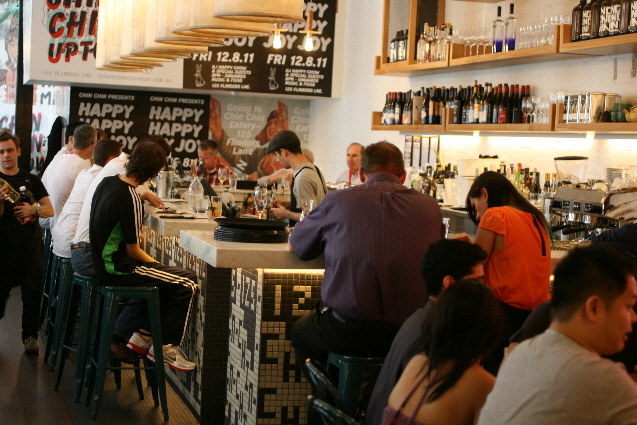 And the food – essentially it’s modern Thai with some cross-border, cross-culture cuisine from Malaysia, Indonesia, Vietnam, China and India – which sounds a bit Pan-Asian, but it’s more contemporary Thai-influenced with the Australian freestyle that exemplifies the urbanity of gastronomy here. Melbourne, Sydney rivalry aside, modern Thai was born in Sydney in the early nineties with doyen chef David Thompson’s Darley Street Thai and Sailor Thai, not only touchstone establishments but a breeding ground for apprentice chef’s in succession being unleashed and adding their own creativity and evolution with a stream of avant-garde Thai eateries (around the world), and notably Thompson’s disciples Martin Boetz (Longrain, Sydney) and Andrew Gimber (Jimmy Liks, Sydney). At the same time Melbourne was evolving its Pan-Asian-Australian with the likes of chef’s Andrew Blake, Geoff Lindsay and Teage Ezard creating a sophisticated level of cuisine and dining experience that was a better fit for the gastronomic capital – least at the time. However, it was only a matter of time before the upmarket Melbourne dining scene would metamorphosis, alas there has been a sea change in recent years with a balancing act between the market demands for good value and yet an insatiable appetence for quality ingredients and innovation in both cooking and the overall experience. 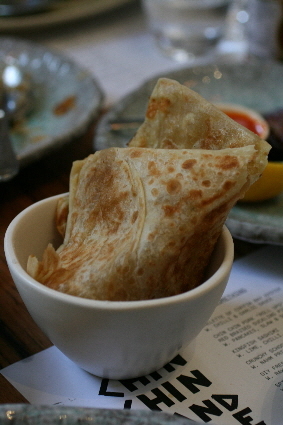 Still, there was no decent (modern) Thai in Melbourne, not until Longrain decided to venture south in 2005, in a joint venture with hospitality industry guru, John Van Handeel. Longrain took the brunt of the transition of no bookings and communal dining, and six years on they remain popular. Chin Chin brings all of this to a new level of dynamic; the food here exuding a raw energy and visually and palpably exciting with vibrant mints and leaves amongst intoxicating exotic spices, robust flavours, tantalizing sweet n sour combinations and just enough spicy heat enticing the taste buds. 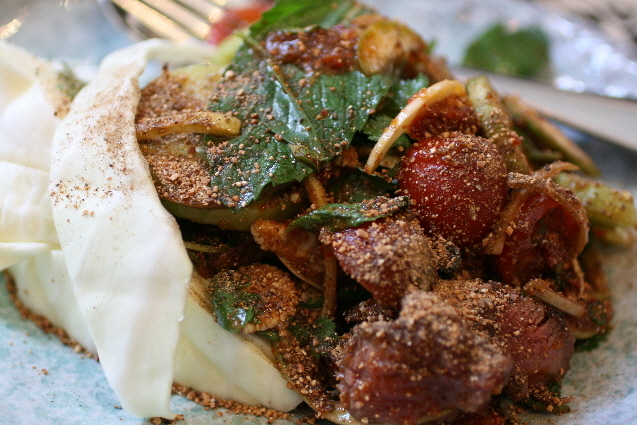 Servings are generous and ingredients wholesome, and there’s clearly a focus on quality produce. It’s one of those menus where you want to order everything, fundamentally designed around sharing dishes and having FUN tasting and experimenting with myriad of exciting flavours and taste sensations. The culinary innovation is a team effort with chef’s Andrew Gimber and Ben Cooper (Nobu and Ezard) constructing an extensive repertoire that is guaranteed to stimulate all the senses. It is not possible to adequately cover all the taste sensations in this review, however to summarize our experience, a table of five, we managed to get through several dishes from each section of the menu. 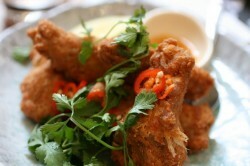 From ‘Little Something’ (A$12 to $18), Omelette of Coffin Bay Oysters w. Chilli & Garlic Sauce – Crispy Sardines w. Nam Prik Pla Yang & Steamed Vegetables – Chilli Salt Chicken Wings w. Coriander & Fresh Lemon and Wok Fried Salt & Pepper Squid w. Nuoc Chum & Vietnamese Mint all disappeared in seconds, what’s more a second serve of Chicken Wings ordered immediately. From the ‘Soups/Noodles/Rice (A$16 to $26), we had Chin Chin Special Rice w. Crab, Pineapple, Chicken & Coriander which got the thumbs up from our 8 year-old daughter, the ultimate arbiter on fried rice, globally! 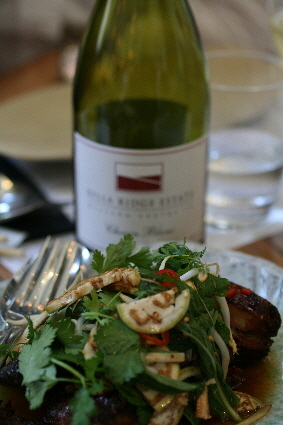 The ‘Green Stuff’(A$15 to $23) is one of the more adventurous sections with some wonderfully exotic combination, having the Crispy Barramundi and Green Apple Salad w. Caramelised Pork, Chilli and Lemongrass, and the Salad of Organic Silken Tofu, Thai Basil & A Hot Sweet Bitter Dressing. Still ploughing our way through the menu, from ‘A Bit More’ (A$23 to $33), the Crispy Quail, Soy Marinated w. Sichuan Salt, Lemon & Siracha, Caramelized Sticky Pork w. Sour Herb Salad & Chilli Vinegar and Crispy Skin Manadarin Duck master Stock Braised w. Yellow Bean basically did is in, full to the eyeballs, although I was disappointed we couldn’t fit in the Stir Fried Wild Boar w. Red Curry Paste, Snakebeans, Ginger and Basil. By this stage we are suitably satiated, savouring the last sip of the Bella Ridge Estate Chenin Blanc 2008 from the Swan Valley, (www.bellaridge.com.au) with its judicious natural residual sugar and invigorating acidity coping absolutely brilliantly with the robust flavours of the whole meal. This winery is my discovery of the year, having met owners Alon and Jodi Arbel recently in Singapore, tasting through their full range and some older vintages, totally impressed by the quality and authenticity of what they are doing . The wine list, as you would expect, is also built for FUN, with a relaxed semblance and relatively concise; that is it’s not a big list but sufficiently broad and eclectic enough to be in simpatico with the food. There are affordable house wines made by local guru winemaker Tom Carson’s and there appears to be a focus on Australian winemakers and the Victorian region, perhaps a ‘buying locally’ philosophy, although there are a sprinkle of imports. Personally, being a wandering palate and having shrugged off the Australian wine predilection, I’d like to see a more global look and really test the boundaries of eclecticism. But be assured, you will have plenty of FUN with the ‘Wine Guy’, veteran sommelier/merchant/vigneron Neil Prentice who is about as provocative, energized and wine and food omniscient as the come. And the service; well with 200 bums on seats at any given time, this is hand-to-hand combat waitering requiring heroic stamina, tolerance and people skills, and above all, teamwork. The team here certainly looks integrated and savvy enough deal with onslaught of humanoids, and yes plenty of theatrics moreover the staff seem to be having as much fun as the diners, but there’s also a genuine level of attentiveness and commendable standard of service. Let’s just say, it’s the sort of place when you look around the room, it’s a battleground and the stretcher bearers (waiters) are doing their level-best to handle the situation, so you kind of become less demanding, and so you should be as you’re meant to be relaxed. By the end of our meal, I am totally relaxed and sliding into a nostalgic meditative hallucinatory state with The Doors L.A. Woman blaring away, and if Bar Go Go was open, lunch could easily become dinner. 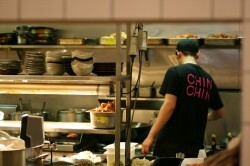 In summary, Chin Chin over-delivers in every aspect; a most satisfying, energizing (FUN) dining experience and I can’t wait to return and work our way through more of the menu, moreover take in more of Melbourne, a fast-evolving megacity in the making with burgeoning restaurant culture.